The U.S. Government is no stranger to brute force. Their only reservations when using it are as to how effectively than can control public relations and sentiment, and how and to what degree the negative impacts can be mitigated. They demonstrated at the Bundy Ranch that as long as the cameras can be kept away, there is virtually no limit to what they are willing to do. The actions of the feds are reminiscent in some ways of the forced busing which was a component of the federal desegregation mandates of the sixties, with a key difference. They were providing equal opportunity to other Americans. Now, the federal government is redistributing the rights and access of Americans to our national wealth, benefits and opportunities to outsiders, squatters. They have absolutely no legitimate right to be here or to claim a share of our America. They are here solely by the dictates of a tyrannical federal fist and boot. The very agencies who are facilitating this invasion are the ones who are derelict in their responsibility to defend us. Given that inconsistency, one has to wonder, as we watch their actions unfold, if what is happening today wasnâ€™t in some way part of the whole grander scheme behind the creation of the Department of Homeland Security. Whether intentional at the time or an improper deviation away from the original mission, they have constructed a central power structure ideally suited for the implementation of Â tyranny. The previous multiple-agency, shared, broad-based and individualized power structure would have not permitted the current systemic abuse which thrives under Homeland Security. The incident last week in Murrieta, CA, may be the new shot heard around the world in the invasion of America. While their mayor seems to be developing a case of weak-knees, the people are adamant. Reports are surfacing that the feds are about to up the stakes. Brietbart Texas hasÂ exposedÂ plans by the DHS to use the now all-too-familiar militarized police type of force on their next attempt to deliver their load of illegals into the community. 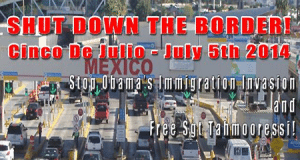 The cameras will be rolling as the invasion of America is carried out by the rogue and criminal Obama regime. The people will stand up, and when they are trampled by the socialists that have seized power, it will be seen by all. More will take their places. This Manchurian president of unknown origin will not succeed in destroying our country. Â Heâ€™s finally pushed too far and woken up the sleeping masses. No amount of empty words can save his fundamental transformation of America now.